Patrick Comerford: Who was Saint Owini? On 4 March we commemorate Saint Owini of Lichfield, hermit. 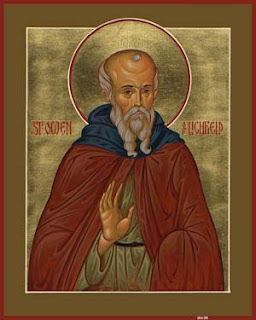 He is commemorated in Benedictine and many Anglian martyrologies, and in Celtic Daily Prayer, with the Northumbria Community. Both the Venerable Bede and the Revd Sabine Baring-Gould’s Lives of the Saints (London: Nimmo, 1907, pp 57-58) provide accounts of his life. Owini was born into a noble family in East Anglia. There he served Saint Etheldreda, also known as Saint Audrey, until Etheldreda joined her aunt Ebba at the monastery of Coldingham. Owini, who had tired of court life, then joined the monastery at Lastingham under Saint Chad. Owini made the journey to Lastingham on foot, earning his keep as he went. Sometime later, he went back and placed wooden crosses along the route to serve as makers for pilgrims and travellers. At Lastingham, Owini chose to work on the land rather than study. He became Saint Chad’s travelling companion and biographer, following him to Lichfield, where he was a novice monk under Saint Chad’s care. Owini was very strong and chose to do outdoor work around the monastery. While the seven other monks were busy reading and writing. One day, while Owini was working alone in the fields near Saint Chad’s residence, hewing down trees, and cutting logs of wood for burning, Owini heard the sound of music or singing apparently descending from the sky to the oratory where the saint was praying. He stayed his axe and looked around, but could see no one. The air was calm and still, the monks were all hard at work in their cells. His Bishop, he knew, was quite alone in his room. Still he felt sure he could hear strains as of persons chanting in a strange, sweet way; the sounds seemed to be in the air as if coming from heaven. Then, after a full half hour, they seemed to die away and return to heaven. He threw aside his axe and hurried up the window. “Go, fetch the brethren from the monastery, and come with them to the church,” Saint Chad told him. “I must pray with you, and speak with you all now while time is yet given me.” When the monks came together in the church, Saint Chad stood before the and, after urging hem to live good Christian lives and to continue keeping the monastic rules, told how, while he was writing, he had heard strains of wonderful music coming towards him from the south-east. He had felt, he said, as if in the presence of a band of angels, who had come, he believed, to bid him make ready for death. When the other monks went away, Owini returned to Saint Chad and begged to know more about the singing he had heard. Saint Chad told him that he had been visited by angelic hosts summoning him to heaven. He then commanded the young monk to tell no one of this until he had died. Saint Chad was quickly taken ill and died on 2 March 672. He had been Bishop of Lichfield or Mercia for just three years. Bede goes on to tell us that he was called “saint” immediately after his death. It is said Saint Owini eventually died in Lichfield soon after, but nothing more is Cathedral. ● This feature was published in the Friends of Lichfield Cathedral Eighteenth Annual Report 2017, pp 41-42.